Jennifer Primosch is a native-born New York artist. Her work draws from the excitement and vivacity of New York City, which can provide everything from magical to surprising experiences. Her world is filled with fantastical creatures, ranging from angels to monsters! 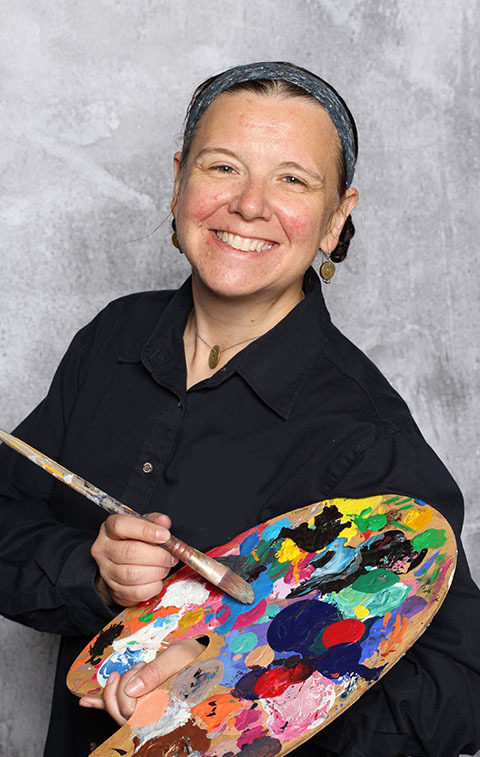 Ms. Primosch is also an art educator who is dedicated to fostering the young artists of New York within school settings and in cultural institutions. Jennifer Primosch was born in Bushwick, Brooklyn in 1972. It was a time of intense upheaval, desperation, and profound artistic creativity. Primosch was raised just over the border in Ridgewood, Queens, by her Brooklyn-born mother and immigrant father along with her younger sister in a traditional two-family brick row house. Her family lived next to her aunt, uncle, and cousins in a true tribal New York lifestyle in an immigrant and multicultural neighborhood. Primosch studied illustration at the High School of Art & Design, graduating in 1990. During that time, she spent hours commuting on the subway and wandering the streets of New York's vibrant neighborhoods and began creating the characters and style that are still with her today. She took on the color and insanity of the city around her and worked it into her art. After high school, she majored in theatre with a focus on design at NYU's Tisch School of the Arts, where she continued her professional work in theatrical design. As an adult, she felt the call back to visual arts and began exhibiting and selling her work. Primosch is a firm believer in public art and chooses to show her work in cafes, theatres, and other places that might have an audience that won't feel empowered to go to a gallery. She prefers to make certain that average people can afford her work and focuses on selling prints, cards, housewares, and other items with her images on them. She also sells original work and hand-painted objects. Primosch continues her mission of making art accessible to all through her work as an art educator. She has taught every age from K-12 and is proud to help young New Yorkers find their artistic voice, a voice they may not know they had. Contact Jennifer to learn more about PRIMOSCH ART.